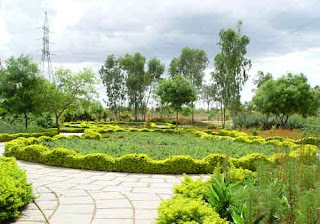 An exquisite eco-tourism site, the Botanical Garden at Hyderabad is a natural habitat for over 600 species like teak, rosewood, neem, mahua, etc. The area is similar to a dry deciduous forest with rock formations, like the Deccan Plateau. It is studded with pine and eucalyptus trees. The bamboo and palm sectors are pleasant walks. Innumerable species of flowers are found here. Nature camps are often organized, comprising a guided tour, nature walk, bird viewing and interactive sessions. The Botanical Garden in Hyderabad extends over 120 acres in Kothaguda Reserve Forest near the hi-tech city, Madhapur. It contains medicinal plants, timber trees, fruit trees, ornamental plants, aquatic plants. It possesses water bodies, vast meadows, natural forests, grasslands and exquisite rock formations.